Caters for a large percentage of the marine market-the inshore and coastal boaters who usually travel solo or as a couple. This rescue concept provides a further safety alternative for coastal waterways by incorporating many features of larger rafts. For the 99% of people who spend 99% of their boating time within sight of land. Compact in size- the raft can be stowed in the smallest of spaces. Just throw- it automatically inflates- this ultra-light raft can be thrown quickly in an emergency situation. It is easier to handle for people of most age groups. Weights only 6,8 kilo. Low maintenance with much smaller servicing costs. Thermally insulated floor which is also reflective for search & rescue teams. 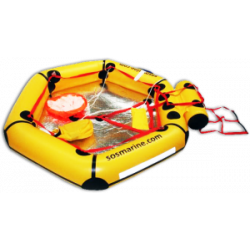 The SOS 2 person life raft has very stable 3 water pockets-165 litres of ballast water. Ultra light: weighs only 6.8 kilos (15lbs) in basic fit out. Suitable for all age groups (adults & children) to handle. Compact valise packed – 500 x 350x 110mm (20”x14”x43”). Large sea anchor-400mm x 600mm (15”.8 x 23.6 “). Disposable 520 gram CO2 inflation system. Thermally insulated floor, this simple feature is also reflective for search and rescue. Compact and easy to stow. JUST THROW- it automatically inflates. Floating safety knife, bailer, life line and rescue quoit with floating line. Durable 210D nylon fabric PU laminated. Roomy 0.96 square metre interior (10.3 square feet). 150cm (59”) of reflective tape. Easier maintenance with much smaller servicing costs. 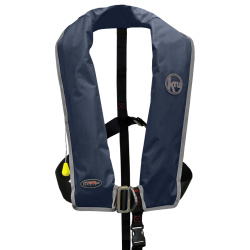 A versatile and lightweight lifejacket that is suitable for all markets. ThisFinger Pulse Oximeter was specifically designed according to the pilot’s requirements. As every person’s body is different, it is therefore important that during flights above 8.000 ft the pilot’s blood oxygen saturation level is measured, in order to avoid any impairment through oxygen deficiency. Furthermore, you can read your pulse at any time. The PILOT FPO is solely to be used for information and monitoring purposes and is no substitution for compulsory oxygen supply needed by law when flying at high altitude. The 3M™ E-A-R™ E-A-Rsoft™ Yellow Neons™ Earplugs have a proven pre-moulded shape that is designed to fit most ear canals and offer substantial ear protection. The soft, hyperallergic polymer foam ensure low pressure in the ear canal and are easy to use again and again. The pre-moulded earplugs simply push into the ear canal for clean and the high attenuation earplugs are ideal for various applications. The Yellow Neons™ are made from a slow expanding polyurethane foam, which helps with providing low pressure inside the ear canal, therefore, creating comfort and wearability. 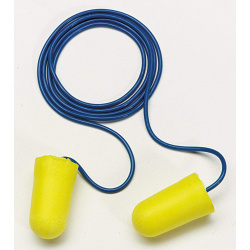 The yellow neon colour allows the user to locate them when working or when someone is using earplugs. The carrying cord allows you to carry the earplugs around your neck if you need to remove them for a break etc. They just connect to the stem of the earplug. The E-A-Rsoft™ Yellow Neons™ Earplugs have a smooth, dirt repellent finish for greater hygiene, longer life and a comfortable fit. They provide excellent noise protection value of 36 dB. Suitable for all frequencies, but a particular focus on low-level frequencies. The E-A-RSoftTM Yellow NeonTM Earplugs have been tested and CE approved against the European Standard EN352-2:1993. These products meet the Basic Safety Requirements as laid out in Annex II of the European Community Directive 89/686/EEC and have been examined at the design stage by INSPEC International Limited, 56 Leslie Hough Way, Salford, Greater Manchester M6 6AJ, UK (Notified Body number 0194). 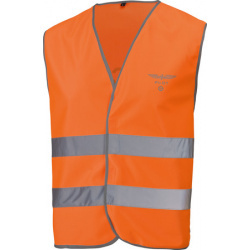 Pilot high visibility waistcoat in EN471 standard with velcro fastener, 2 reflective band and 2 reflective print logo. This Carbon Monoxide Detector can save a pilot’s life, especially when flying with the heater on, by warning of the presence of CO in the cockpit—the spot will turn gray/black when CO is in the air. The spot on the detector returns to normal color after it is exposed to fresh air. You can use this CO-DETECTOR as your personal and portable CO detection device. With the adhesive back, stick it on the panel or dash for a semi-permanent installation, or wear it on an ID badge or on a lanyard. Useful life is 90 daysonce opened. Carbon Monoxide (CO) is an extremely hazardous colorless, odorless, and tasteless gas that can lead to potentially fatal pilot incapacitation in small quantities. Deadly Carbon Monoxide (CO) is produced wherever fossil fuels (such as gasoline, kerosene, diesel, natural gas, and propane) are combusted without sufficient oxygen. Powered aircraft are only sometimes fitted with a CO detector, but more often than not they lack a replacement date. This is extremely dangerous as most commercially available CO detectors lose their protective function after a period of about 90 days! Due to exactly this reason, we have developed a personal PILOT CONTROLLER KIT® for the safety conscious pilot. This kit can be easily fixed to all our kneeboards featuring a stopwatch fixture. 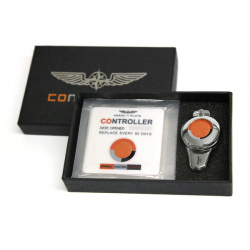 This simple and precise control can distinguish the PILOT CONTROLLER KIT® from the rest and make it an indispensable companion for flying safely.